Grand Master Olaf Emil Simon was one of the early pioneers of martial arts in North America, especially in Western Canada. Born in East Prussia in 1929, he began learning Kung-Fu at age six. In the final months of WWII, young Simon briefly served in the German army when he was barely sixteen. Captured by the Soviets, he was sent to a prisoner-of-war camp in Siberia, from which he eventually escaped, making his way through Mongolia. 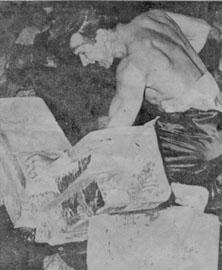 In 1960 Olaf Simon immigrated to Canada, where he began teaching martial arts, opening his first studio in Calgary in 1961, and expanding shortly thereafter to Edmonton and other cities in Canada and the U.S. In the 60’s and early 70’s, Simon gained an international reputation through his unparalleled breaking, sparring, and unchoreographed self-defense demonstrations (often involving multiple attackers, real knives, and other live weapons). He gave unique and devastating performances in competitions, served as an international referee at world championships, and worked and exchanged knowledge with other great martial artists of his time, including Grand Masters Ed Parker, Frank Lee, and Stan Lee. 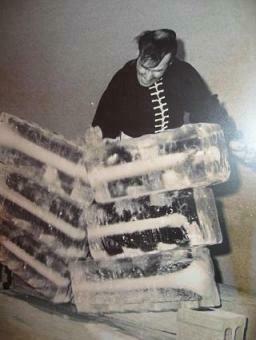 In 1970, Olaf Simon appeared live on national television, breaking 1270 lbs of solid ice with a single, bare-arm blow, and setting the (still unbeaten) world record for the greatest ice break without spacers. Grand Master Simon is internationally known as the founder of the Temple Kung-Fu studios, which had taught his Moh Pai and Pai Hu Shih (White Tiger) systems to countless thousands throughout North America. He is currently living in retirement and seclusion in British Columbia, Canada. His legacy lives on through Moh Pai Defensive Arts and other clubs set up by Masters and senior practitioners committed to training and promoting his unique style of martial arts. On May 15, 2010, in recognition of his immense contribution to the development of martial arts in North America, Grand Master Olaf Simon was inducted into the Canadian Black Belt Hall of Fame. Copyright © 2019 Moh Pai Defensive Arts, all rights reserved.